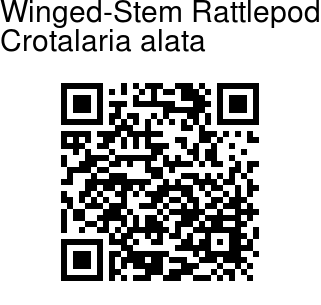 Winged-Stem Rattlepod is a herb or shrublet, erect, 5-100 cm tall. Branches are zigzag, silky hairy. Stipules lie flat on the stem as a broad wing. Leaves are simple, nearly stalkless. Leaf blade is elliptic to obovate-elliptic, 3-8 × 1-5 cm, base flat to wedge-shaped, tip blunt with a short point. Flowers racemes arise at the end of branches or leaf-opposed, 2- or 3-flowered. Bracts are ovate-lanceshaped, about 3 mm. 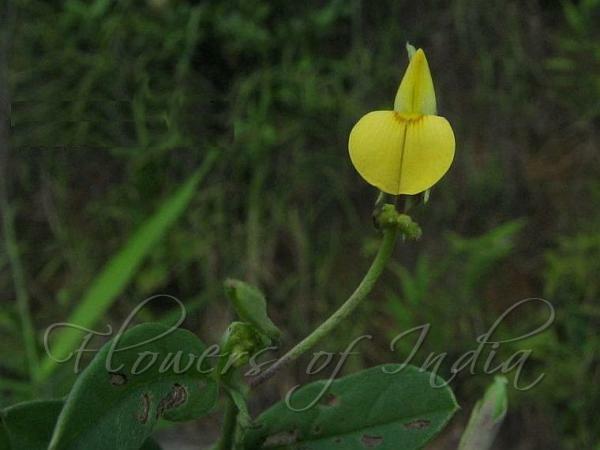 Flower stalks are 3-5 mm. Bracteoles are in­serted at base of sepal tube, similar to bracts. Sepal cup is 2-lipped, 6-10 mm. Sepals are lanceshaped, long-pointed. Flowers are yellow - standard petals obovate-circular, 5-8 mm, bearded at the tip. Wings are oblong, shorter than standard. Keel is ovate, apically with a long twisted beak. Pod is oblong, 3-4 cm, 30-40- seeded, sparsely velvety or hairless, tip with a slightly curved beak. Seeds are obliquely heart-shaped, smooth. Flowering: June-August.